Take the first Step toward your Dream in "Sapporo!" We have opend a Japanese language school in Sapporo, the largest city in Hokkaido! Sapporo is a Hokkaido’s center of politics, economy, education and culture. Although Sapporo is such a big city with a population of around 2 millions, it offers a great deal of nature. Would you like to learn Japanese at the place, where city and nature have grown together? The prices and rents are cheap(the average rent is ¥33,000), and since the average temperature in August is 22.3ºC, it’s comfortable to live here. There are many famous sightseeing spots, and a variety of seasonal events, and of course a lot of different delicious dishes like Seafood, Jingisukan, soup curry, ramen and so on! 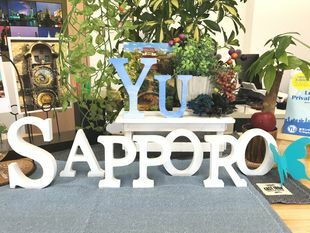 Let’s start your study in Japan together, at the Yu Language Academy! Friendly and cheerful teachers are waiting for you! Living a Comfortable Student Life in "Sapporo", urban natural city at the center of Hokkaido! ・Student Dormitories - It takes only 30 seconds from our dormitory to the school. We have another dormitory offers a meal plan and a courtesy bus to the school. ・Part-Time Jobs Arrangement - Our partner companies provide you with various part-time jobs according to seasons. ・School Scholarship Program - JPY 100,000 will be benefited for the finest student once every three months. ・You can regularly take trial lessons at our partner university or specialized training college. ・Support to study at our partner university or specialized training college - We are able to offer you special entrance examinations and tuition fee exemption. ・Study in Tokyo - We have also two Japanese schools (Yu Language Academy, Yu International Cultural Academy) in Tokyo. Cooperating with these schools, you have a chance to study in Tokyo. Sapporo has a lot of snow in Winter. 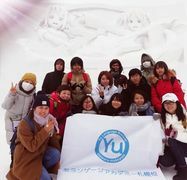 With some students had never touched snow before, we together made Snowman. We enjoyed a game party after christmas completion ceremony. Students are arranged into classes with an average of about 15 students in each class. One teacher takes charge of one class throughout the year, which allows the teacher to keep a close eye on each of the students. Regular examinations and counseling help teachers to always have a clear idea of the students' Japanese skills, which allows us to customize the curriculum for students when needed. Lessons conducted using computer and electronic teaching materials, with special consideration on proficiency of lesson time. 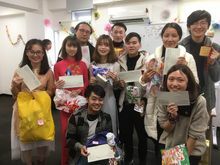 The counseling in foreign language is regularly held and it allows you to counsel about your study and life in Japan in your own mother tongue. Kanji class prepares the original Kanji-textbooks. The class is organized according to Kanji skill. ●Application Condition :Class attendance must be 95% and above.